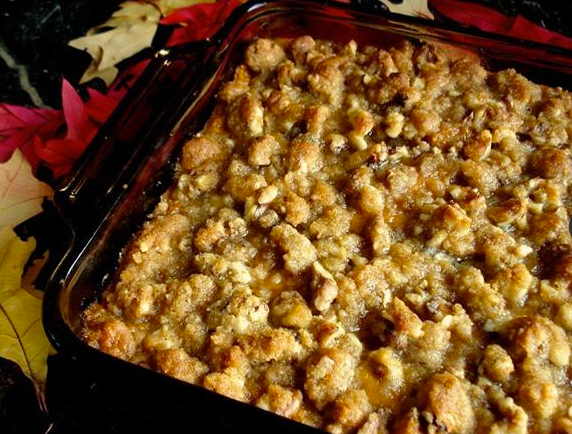 heather & olive: sweet potato casserole. A self-deprecrating sense of humor. This is not a photo of my sweet potato casserole, but this is probably what it will look like when I make it tomorrow. Preheat oven to 350 degrees, and grease a 9" x 13" baking dish [I usually make it in a french oven--any sort of baking apparatus will do.] In a large bowl, mix together mashed sweet potatoes, 1/2 cup butter, milk, white sugar, vanilla extract and eggs. Spread sweet potato mixture into the prepared baking dish. In a small bowl, mix together brown sugar and flour. Cut in 1/3 cup butter until the mixture is crumbly, then stir in the pecans. Sprinkle the pecan mixture over the sweet potatoes. Bake for 25 minutes, or until golden brown. It's not low-fat, but that's not what the holidays are about. Happy gluttony! Happy Thanksgiving! This looks unbelievable.